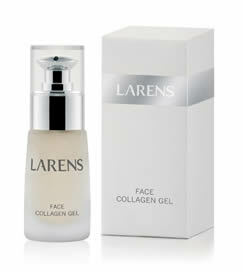 Collagen gel for care of the face, neck and neckline. The face looks like it had a major facelift after using it several times. It becomes smooth and the moisture, firmness and elasticity is improved. The product reduces wrinkles and prevents new ones from arising. Collagen, due to its unique capabilities creates a protein net in the skin so that the skin does not lose moisture, and the cells become firm and stimulated. The skin starts to produce its own collagen. The skin becomes more smooth and delicate, and its elasticity and tension is improved. The skin quickly regains its firmness, elasticity and healthy appearance. It smoothes wrinkles and slows down the ageing process. In the collagen formation process in addition to protein, peptide chains and free amino acids are obtained. The main activity of peptides is to facilitate “communication” between skin cells. They stimulate the natural physiological processes in the skin. In addition, peptides also reinforce the protective layer of the skin by preventing the action of harmful factors. Amino acids have the ability to retain moisture and are a component of NMF (Natural Moisturizing Factor). They moisturize, increasing the hygroscopic action of other NMF components. They moisturize the skin, making it more elastic. Action: intensively moisturizes and firms the skin, smoothes existing wrinkles and prevents new ones from arising, makes the skin more elastic, smooth, and clearly rejuvenated and effectively slows down the skin ageing process, also visibly improving the shape of the face.